One of the only heirs of the Lancaster line of the royal family, Margaret Beauford is a very important young girl, but still a powerless one. She is utterly convinced that she has a vocation and desperately wants to be a nun. As a young lady with royal blood in a time when the king is childless and perhaps slightly crazy, Margaret is not to have the luxury of choosing her own fate and going into a convent. Instead, she is expected to breed, to produce a son for the Lancaster line. Not only that, neither she nor her family have any say in who she is to marry. At twelve she is wedded to King Henry VI’s half-brother, the twenty-something Edmund Tudor. At thirteen, days after the death of her husband, Margaret gives birth to a son, Henry Tudor, and has a vision that he will one day be King of England. Suddenly, Margaret has a new vocation from God: seeing her son crowned. “The Red Queen,” I think, is even better. 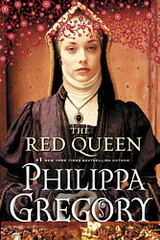 Gregory still suffers from a bit of the repetitiveness that she showcased in “The White Queen,” but I think it came off better, and flowed more naturally in this book. Yes, Margaret did express her belief in her religious vocation ad nauseum in the beginning of the book in particular, but she was a very head strong young preteen and teenager, so it fit with her character. In fact, she was obnoxiously headstrong and self-righteous throughout the entire book. The fact that Gregory kept me enjoying “The Red Queen” as much as I enjoyed “The White Queen” with its much more sympathetic protagonist is what makes me say that this is actually the stronger book. If you gave up on Gregory after some of her weaker Tudor books, try her Cousin’s War series. You can really start with either “The White Queen” or “The Red Queen,” but I recommend that you give it a try. If you don’t already know what this book is about, there is a good chance this isn’t the sort of book you would like, because this has got to be hands-down the most talked about historical fiction novel of the past 12 months: Henry VIII’s court from Thomas Cromwell’s point of view. Thomas Cromwell. Not, perhaps, the most sympathetic character from Henry VIII’s reign, and there were an awful lot of unsympathetic characters running around that court. In most works of historical fiction, Cromwell is vilified, detested; he is a horrible, horrible man who craves naught but power and influence. Honestly, doesn’t sound like the sort of man that I would like to read a 600 page book about, whose head I would want to be in for that long. But Mantel does something special with Cromwell in “Wolf Hall.” She humanizes him, and actually makes him sympathetic. Honestly, I’m not even sure how she did it. Although we are somewhat in Cromwell’s head throughout the story, her narration is still in third person and somehow everything seems a little on the distant side – I felt almost as if I was watching everything take place through a pane of frosted glass. And yet, I felt that I understood him, that I cared what he thought and felt. One of the main things that everyone has talked about with this book is the fact that it is a difficult read. In particular, Mantel almost always refers to Cromwell simply as ‘he’ and, yes, when he’s talking to other men, that gets very confusing. And really, some of the passages are just plain dense, and a bit hard to get through, in the second and third sections particularly. But then, in the second half of the book, it just all came together for me. I was completely drawn into the story by that point, I was used to Mantel’s writing, and it all just flowed. I loved it. LOVED it. I’ve never read Tudor fiction like this, I’ve never seen Cromwell as a character like this and, despite early difficulties, I absolutely adored it. A note on how I read this: I actually read “Wolf Hall” over about six weeks, reading a section each weekend to discuss on Monday with a friend. Although the discussions petered out, I think that reading it like this really worked well for me. Trying to read the entire thing at once might have burned me out, but having it as my weekend read with other books during the week always left me wanting more, particularly towards the end when I got really into it. This review was done with a book received as a gift.